Executive Vice President/Admin. & Ops. CAD Engineers: Mech'l., Piping. Struct! A Modular Graduate Degree Program of- fered in the summer months of 1985,1986 and 1987, commencing May 6, 1985. 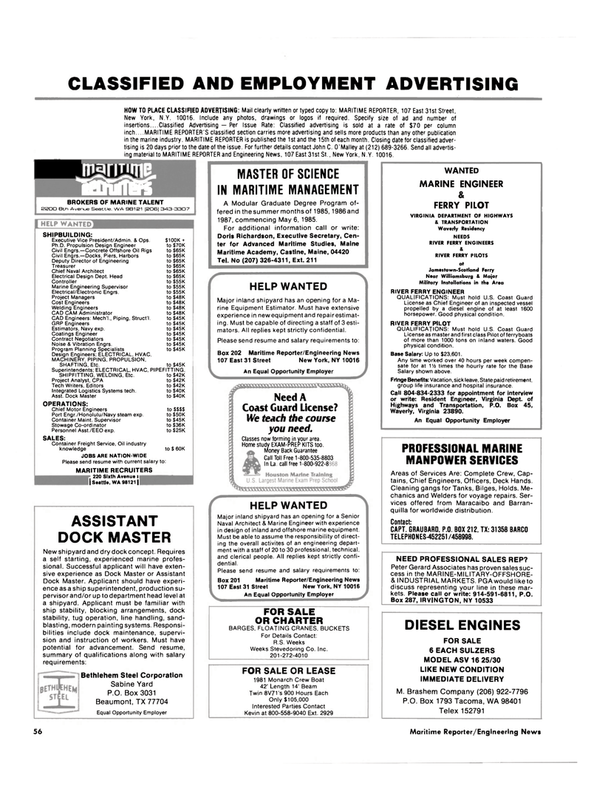 Major inland shipyard has an opening for a Ma- rine Equipment Estimator. Must have extensive experience in new equipment and repair estimat- ing. Must be capable of directing a staff of 3 esti- mators. All replies kept strictly confidential. Naval Architect & Marine Engineer with experience in design of inland and offshore marine equipment. License as master and first class Pilot of ferryboats of more than 1000 tons on inland waters. Good physical condition. Base Salary: Up to $23,601. Fringe Benefits: Vacation, sick leave, State paid retirement. group life insurance and hospital insurance. Peter Gerard Associates has proven sales suc- cess in the MARINE-MILITARY-OFFSHORE- & INDUSTRIAL MARKETS. PGA would liketo discuss representing your line in these mar- kets. Please call or write: 914-591-6811, P.O.